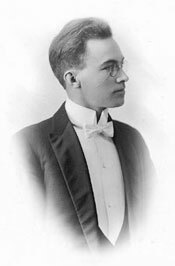 One of seven children born to an itinerant Swedish Lutheran minister, Gerhard Theodore Alexis dedicated his life to the music of the church as an organist, composer, arranger, singer and choral conductor. Gerhard was born in Dodge County, Nebraska, on April 12, 1889. His early studies and positions led him through the midwest to Stockholm, Sweden, where he studied at the Royal Musical Conservatory. He also traveled the United States and Sweden with three of his four brothers as the Alexis Male Quartet. 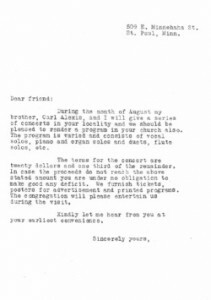 The multi-talented family members gave concerts that included vocal solos, duets and quartets; organ, piano and flute works, as well as dramatic recitations. 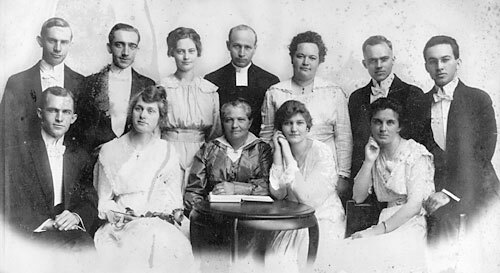 In 1916, Gerhard accepted the position of organist and choirmaster at First Lutheran Church in St. Paul, Minnesota, where he and his wife, Olga Maria Grund, raised their three children. 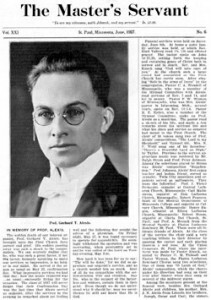 In addition to his duties at First Lutheran, he served as professor of music at the Minnesota College’s School of Music and at Phalen Luther Seminary. 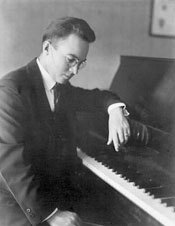 Gerhard also taught privately and performed publicly throughout the midwest as an organist and singer. 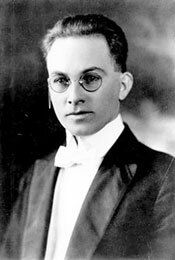 He was a member of the St. Paul Federation of Lutheran Brotherhood’s Male Quartet and was a Fellow of the American Guild of Organists. Gerhard died at the age of thirty-eight on May 31, 1927, of peritonitis following an appendectomy. He rests in St. Paul’s Union Cemetery. The majority of his numerous organ compositions, as well as many of his sacred vocal and other instrumental pieces, remains unpublished and unrecorded. The Master’s Servant was a publication of First Lutheran Church in Gerhard’s day. This issue was published shortly after Gerhard’s death and is devoted almost entirely to honoring his life and work. 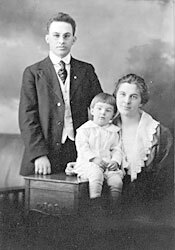 Biography of Gerhard T. Alexis, Jr.
Gerhard’s eldest child and only son, Gerhard Junior, was born on January 20, 1918. Despite losing his father at age nine, “Junior” (as his mother fondly referred to him) excelled at music and school from an early age, completing his Ph.D. coursework during his twenty-first year. 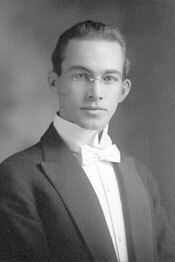 He supported his schooling by working summers at Glacier National Park, affording him experiences which would profoundly influence his later academic work. He returned from his service as a lieutenant in Europe during World War II and married Ilene Linnerooth on August 16, 1947. 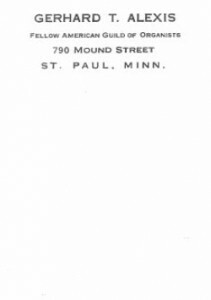 That same year he began a respected lifelong career at Gustavus Adolphus College in St. Peter, Mn, where he taught American Literature and writing. He is especially remembered for the development of his well-received course Wilderness and the American Mind. He retired in 1983 after thirty-six years of service, having received the Greater Gustavus Award. His photograph hangs in the room where he taught, which is known as the Gerhard T. Alexis Room. Gerhard and Ilene continue to be honorably remembered at Gustavus by the Gerhard and Ilene Alexis Memorial Bluebird Trail and by the Gerhard and Ilene Alexis Scholarship Fund. They died together in an automobile accident on January 31, 1993, while returning home from church. 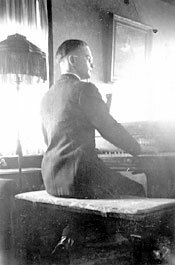 Gerhard Jr. playing Dad’s piano, circa mid-1930s, with Theresia’s painting of Jesus above piano. 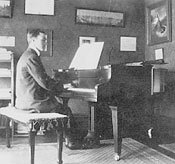 Gerhard at his new Chickering baby grand piano, St. Paul, February 1918. His sister Theresia’s painting of Jesus hangs above the piano.